Ethiopia entered 2017 under a state of emergency rule. A measure imposed in October 2016 following deadly protests largely in the Oromia region. Mass arrests were made and a Command Post with sweeping powers of arrest was put in place. What has been described as the draconian terms of the rule among others restricted movement of even diplomats had been revised in the wake of what government said was a ‘return to peace,’ but which activists tagged as a time-bound gagging of popular protests. Upon its initial expiration, the parliament in April 2017 voted to extend the state of emergency by four more months. Addis Ababa said it was to consolidate peace efforts. Over the period mass release of prisoners were announced – most of them after undergoing rehabilitation by the state. But it was in March 2017, the country recorded its first deadly incident following an accident at one of its biggest landfill sites in the capital Addis Ababa. A landslide at the Koshe landfill site killed scores of people leading the government to declare three days of mourning. In all 115 people were said to have died with about 75 women involved according to official records. In June this year, Authorities were said to have started disbursing compensation of $4m to persons affected by the landslide. The site was the city’s only landfill facility and hundreds of people lived near the dump. Most of the victims were persons who scavenged for food and items that could be sold, such as recyclable metal. Finally in August, lawmakers agreed to lift the state of emergency rule – which had cut 10 straight months. But it was not long before a fresh security crisis kicked. Deadly clashes in the country’s east between people in the Oromia and Ethiopia-Somali regional states. It led to deaths and mass displacements of persons on both sides. 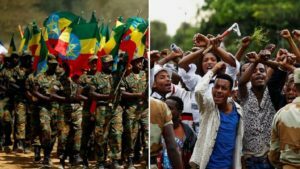 Even though the government via PM Desalegn put it down to rent seekers in the regions, Oromo activists blame a paramilitary force – the Liyu Police – for stoking the tensions. The border crisis has recently escalated killing 61 people according to the government. In between this is a seeming bubbling of anti-government protests especially across the Oromia region. The government also announced the deployment of unarmed security personnel for 2017 Irrecha Thanksgiving ceremony of ethnic Oromos. It was after the festival stampede in 2016 and protests thereof that the state of emergency was imposed. Eventually, the 2017 Irreecha run smoothly as activists protested, celebrated and mourned the passing of their loved ones. Occasionally there were reports of arrest and jailing of dissidents the government called anti-peace forces supported by Eritrea and other entities. Leading opposition leaders Merera Gudina and Bekele remain in jail as their trials continue to move at snail pace amidst twists and turns. Other activists also suffered from similar meandering trials. Federal forces were banned form intervening in the Oromia – Ethiopia Somali crisis but they reports indicate that they are very much operating in other parts of the Oromia region. The 16 deaths in the town of Chelenko in the region has been blamed on federal forces. They are also accused of killing four people in October this year. A security crisis in universities across the country has also led to the deployment of federal forces across campuses. This is despite an admission by the government that the situation is more political in nature. There was bomb explosions in the northern city of Gondar whiles the Oromia region observed a social shutdown called by the opposition Oromo Federalists Congress (OFC). The government in all of this repeatedly gave assurances of being on top of the security situation. They, however, resolved to ban protests across the country as part of a national security move. The ruling coalition, EPRDF, late last year admitted mistrust among its ranks as activists speculated deepening rift. A political tsunami by way of the resignation of the speaker of parliament, Abadula Gemeda in August turned round 360 as he is reported to have rescinded his decision. Ethiopia, meanwhile, hosted the African Union Heads of State summit in January and also the elections of the Confederation of African Football. It has hosted the United Nations refugee chief, human rights chief, secretary general and the IMF boss amongst others.